It was two years ago to the day that my “mommy group” gathered at my country home with our babies for a long-awaited getaway together. It was a weekend full of fun and laughter. But all that changed in a blink of an eye. This is an article I wrote shortly after that fateful weekend and I thought it would be worth sharing on this day. Thank you to Berit and Sebastian for letting me share this story. When I heard the woman screaming for help, I did not hesitate – this time. I flew from the checkout where I had been waiting in line with my groceries and ran to her, quickly realizing she had a baby in distress. This was my moment, and I knew exactly what to do. Flashback three months, to what was the most frightening experience of my life. My three girlfriends and I had finally gathered at my remote country home with our young babies in arms. We had anticipated this baby weekend getaway for months and were so happy to finally be there. The kids were precious in their brand new little rubber boots, and we moms spent most of our time laughing. The morning of the incident, we had all gathered at the kitchen table for our breakfast. Jodi, a bartender in her early years, mixed us some amazing Caesars and we joked that somebody had better stay sober in case we had to drive to the hospital. 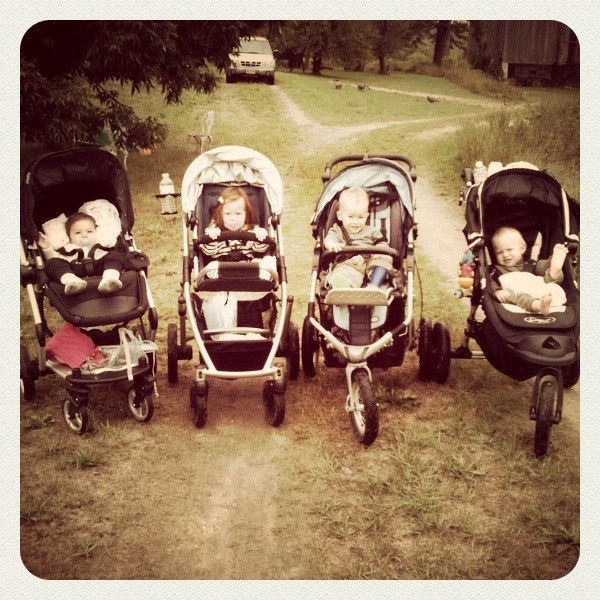 Selena, Alessia, Cal and Sebastian ready for a country walk the day before we called 911. Ha, ha. Little did we know that half an hour later, we would be placing a 911 call and doing exactly that. Seventeen-month-old Sebastian had run a fever that morning. He felt hot, but not so hot that we felt the need to take his temperature. He went down for his morning nap and slept well. Upon awakening, he still felt warm but was his precious little self otherwise, and we thought nothing of it. We were gathered in a group watching a video on someone’s iPhone when his mother, who had been holding him at the time, realized something was wrong. We were all so shocked at the suddenness of it. Sebastian had gone stiff in his mother’s arms. He was unresponsive, frothing at the mouth and was turning blue. Two of us scrambled for our phones and managed to place the emergency call while his mother ran to the living room and watched in horror as our friend performed CPR on his little body. He’s dying, his mother was screaming. Those screams I will never, ever forget. It was absolutely terrifying. After what felt like an eternity (but was actually only a minute or two) Sebastian’s breathing became regular, and he was in recovery. We didn’t know it at the time, but he had just come through his first febrile seizure. Flash forward to the grocery store. It was definitely my moment. I grabbed the baby from the screaming mother and recognized immediately what was happening, thanks to the Sebastian experience. The 911 call was placed and I was able to establish very quickly that, despite being blue in colour, his heart was beating and as I held him, I could feel him taking little breaths. I placed him immediately into the recovery position, and eventually, he came out of his seizure and his body relaxed. The entire time I calmly reassured the mother, who was absolutely terrified, that he was going to be alright. When the ambulance arrived and I left the grocery store 15 minutes later, I sat in my car and cried. I thought of little Sebastian, and how the horror of that day at my country home had changed my life – all of our lives, in fact. The universe had made me witness something so frightening, but in doing so had provided me with the gift of knowledge. I marvelled at how I was somehow meant to be at that grocery store, at that moment, if only to save a mother from thinking that her baby was dying. That was Sebastian’s gift to me, and my gift to her. Years have passed since that moms-and-babes getaway, but what happened that weekend has stayed with each of us. The experience left us raw, but it brought our friendship even closer. We made taking a first aid course a priority (as should we all!) and feel better prepared for the unexpected in general. I have included some information about febrile seizures below. It is my belief that all paediatricians should be screening for this. It only takes a second to explain, and it could save a new parent from experiencing that terror of thinking their baby is dying. According to Epilepsy Ontario, febrile seizures (febrile, meaning “feverish”) are a virtually harmless medical incident experienced by three to four per cent of children, usually boys, between the ages of three months and five years. While they can be frightening, febrile seizures usually end without treatment and don’t cause any other health problems. Having one doesn’t mean that a child will have epilepsy or brain damage. But, they can be terrifying to witness. Your baby’s body will stiffen, his eyes will roll upward and his head and limbs will be jerky. Often the child will froth at the mouth and can turn blue. These seizures are caused by a sudden spike in body temperature, in fevers generally above 38.3 degrees Celsius. Children are vulnerable to these seizures because of their developing brain, but other factors like a history of febrile seizures in the family will make them more susceptible. In Sebastian’s case, after his first seizure they discovered that his father had experienced febrile seizures as a child. If this is your child’s first seizure, call 911. Stay as calm as you can. Most febrile seizures last between 30 seconds and 2 minutes. Place your child on a flat surface on his side in the recovery position. Do not move him unless he is in danger or near something dangerous. Do not restrain him. Contrary to popular belief, you can’t swallow your tongue during a seizure. Wipe away any vomit or saliva outside his mouth, but do not put anything between his teeth. The mother at the grocery store was trying to pour water in her child’s mouth. This is NOT a good idea. Do not attempt to put anything in his mouth. When the seizure stops, keep your child on his side in the recovery position. After the seizure he will be sleepy. Allow him to rest and gradually wake him. Research from Aboutkidshealth.ca, says that there is a 25 percent chance that if one child has a febrile seizure so will their younger sibling. Talk to your child’s paediatrician if you have any questions or concerns. After much hammering, sawing and sweeping, the back corner of our barn has been transformed into a cosy pen for our two latest residents. 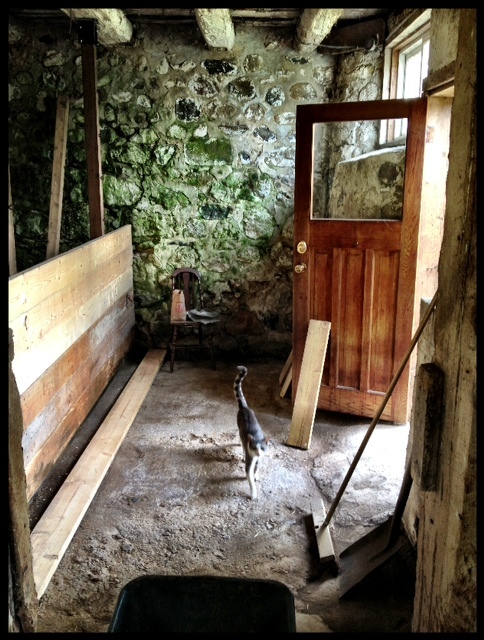 Beginning stages of building the stall. Meet Stella and Beulah. Named respectfully after two great-grandmothers. 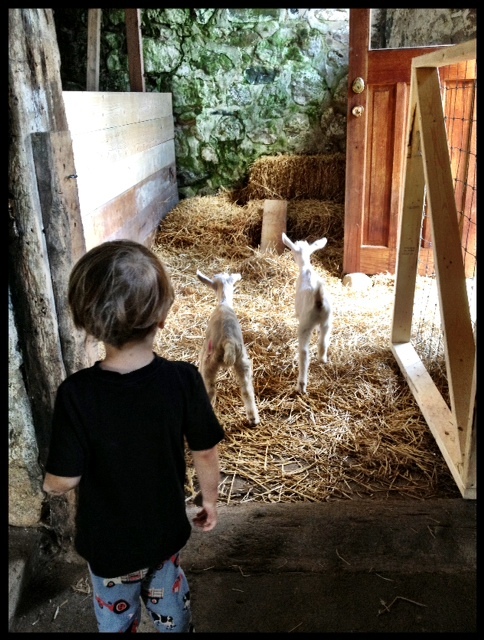 Our 7 week old “kids” arrived last week from my friend Robin’s farm. Robin is a local farmer and paramedic who I went to school with from Kindergarten right through high school. 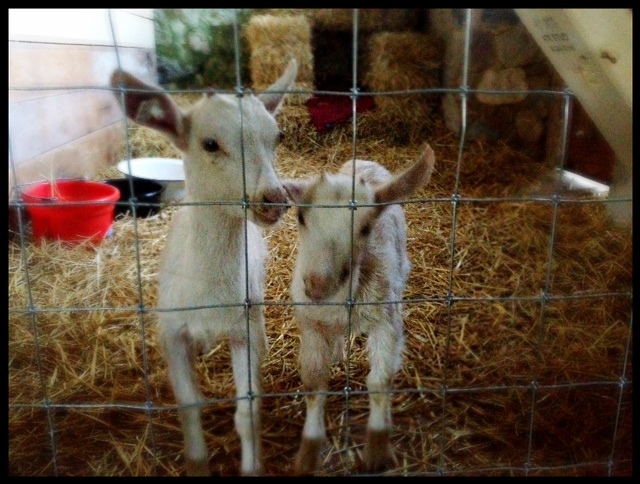 When these two little twin girls were born she texted me that they should be mine. I, of course, could not agree more! The cats are having a difficult time accepting that the pen was not being built for their pleasure, and that there are now creatures in their universe that they are unable to kill or intimidate. It’s quite funny to watch them face-off. 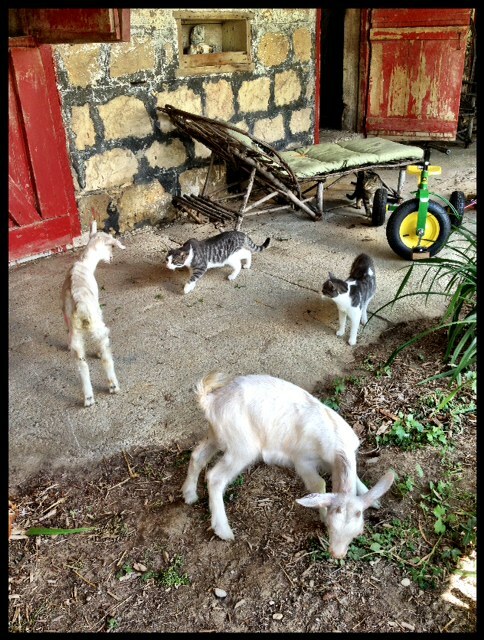 The goats are unfazed. Phase One: chickens, has gone smoothly. The “ladies” aren’t as eager for their kisses anymore, but endure them nonetheless. They are fully grown now and quite beautiful. 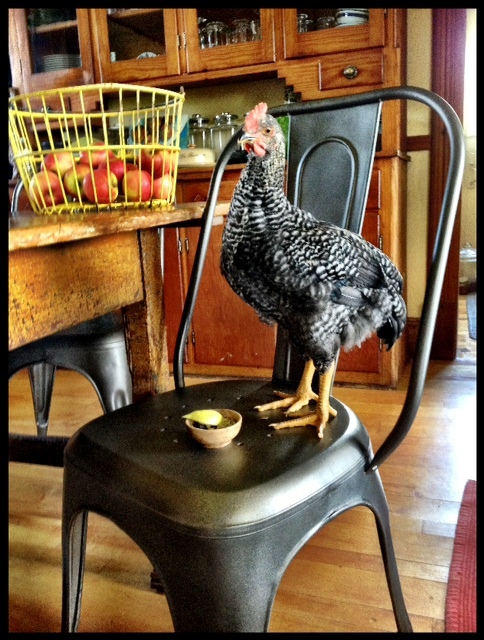 Check out this picture of Henrietta (who is not typically welcomed into the house but snuck in by one of the girls)! They will be laying for us by the end of summer. Now, it’s time to find some work clothes. I can’t be mucking out pens in my summer dresses and sandals!